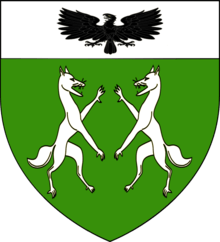 The O'Donoghue of the Glens (Ó Donnchadha na nGleann), Prince of Glenflesk, is the hereditary chieftain of his sept of the Kerry Eóganacht. In 1944 his father was one of the few Chiefs of the Name recognized by Edward MacLysaght, the first Chief Herald, as having a verifiable pedigree and entitled to use the title and receive courtesy recognition by the Irish State. The Eóganacht dynasties ruled the south of Ireland for 500 years or so till the end of the first millennium. According to the Irish origin myths, they descend from Eógan Mór II, son of Ailill Aulom, who was son of Mug Nuadat, (Eógan Mór I), who was supposed to have lived some time in the 2nd century. Over the years, various septs of the Eóganacht branched off and some faded into insignificance. The O'Donoghue of the Glens is one of the Eóganacht lineages which remain to this day with an acknowledged Chief. According to tradition, The O'Donoghue Mór and The O'Donoghue of the Glens descend from sons of Auliffe Mór O'Donoghue (d. 1158), Cathal and a younger son Conchobar, respectively (though Y-DNA evidence suggests they are of different lineages). Auliffe Mór's dynasty is that of the Cinel Laegarie of Eóganacht Raithlind/Uí Echach Muman, whose original territory was in West Cork prior to the time of Brian Boru, after which they invaded and secured the kingdom of the Eóganacht Locha Léin, displacing the Loch Lein O'Moriarty's and O'Carrolls. There was much internecine war during the time of Auliffe Mór, when the O'Brien dynasty of Thomond were battling (ultimately unsuccessfully) for control of all Munster. The O'Briens were pressuring the Eóganacht from the north and the east, forcing them southwest into Kerry. :45 The Cashel O'Donoghues, by then pressured by their Eóganacht cousins, the increasingly powerful MacCarthy dynasty, would surely have been amongst them. Auliffe Mór was arguably one of the most powerful warlords of the time and it would not be unnatural for a weakened Eóganacht sept to join Auliffe Mór, who was successfully preventing the O'Briens from overrunning South Munster. He completed the cathedral of Achadh Dá Eó on the heights overlooking the Lakes of Killarney just prior to his death in 1158. It was during a campaign in Waterford that same year that Auliffe Mór was killed on the bank of the River Suir by Muircheartach son of Toirdhealbhach Ó Briain, well east of the MacCarthy territory, which indicates the scope of his efforts to maintain the sovereignty of Desmond. In the following years, a number of sons of Auliffe Mór are recorded in the annals – Aed, slain 1161; Muirchertach, slain 1163; Murchad, died from wounds, 1169; Cathal (ancestor of the Mór) slain fighting the oversea men, 1170; Conchobar (ancestor of the Glens) slain 1178 ('la Donhnall, lá derbrathaire fein' added by a later hand and perhaps inaccurately translated as 'by Domnall, his own 'brother) 1178; Domnall, slain 1178. Next recorded in The Glens pedigree is Aoch na Meidhe (of the monks) (d 1231), then Séafra of the Mansion (d.1253) recorded as living in Glanerought on the Tousist peninsula. This is the first mention of the given name, which has been traditionally used through the generations of the family for eight centuries. According to Burke, the title first appeared in the 14th century with Geffery O'Donoghue of the Glynn. In the 16th century, the lands of The Glens comprised 'the wild glen of the Clydagh' and the parish of Killaha. Their family seat was Killaha Castle, overlooking the Glen of the Flesk River, built in the 16th century. Alas, alas, how weak is nobility now! Glenflesk itself was known as the haunt of outlaws and tories, and in popular parlance the English referred to it as the 'Robbers Glen'. The dispossessed families of The O'Donoghue Mór had fled to the glens after the family's attainder in 1586 following Rory Mór's death at the end of the Desmond Rebellion, and they were no doubt the core of the rapparees inhabiting that stronghold in the Glen of the Flesk. They became notorious as the 'Dangerous O'Donoghues' who constantly harassed the English colony brought into the Killarney region by the undertaker Browne family, known as the Earl of Kenmare. In the late 18th century, the Glen was a haven during the Rightboy Movement which originated in Munster. Throughout the centuries, the Glens family managed to retain their title and territory, and eventually built Killaha House near their ruined castle. The Chiefs were consistently devoted to Irish independence and one of the few Gaelic magnates who did not conform to the established Church. They remained in their territory throughout the years of English oppression, never faltering from their faith or deserting their clann. In the middle of the 19th century Daniel Ó Donoghue, MP from Tralee, married Marie Sophie Ennis, the only daughter and heiress of Sir John Ennis. Upon the death of her father, the family moved to her estate at Ballynahown Court near Athlone. Killaha House became a Presbytery in 1887 and is currently in private hands. The ruined castle is now a national monument owned by the Office of Public Works. The current Chief, Geoffrey Paul Vincent, lives near Tullamore in County Offaly. He is a member of The Standing Council of Irish Chiefs and Chieftains with a keen interest in Irish history. He has seven children, and his son, Geoffrey is his chosen Tánaiste (successor). 1 2 3 Minahane, John, The Poems of Geoffrey O'Donoghue.